51 jurisdictions across the globe sign agreement on the automatic exchange of tax information in an international clampdown on tax evasion. Today the UK, alongside 50 other countries and jurisdictions from across the globe, is taking the next step in stamping out tax evasion by signing a new agreement at the Global Forum in Berlin to automatically exchange information. Under the agreement, unprecedented levels of information, including account balances, interest payments and beneficial ownership, will be shared with the UK from countries across the world in an international clampdown on tax evasion. Today marks a negotiating triumph for Britain, and our close ally Germany, in the fight against tax evasion. It was three years ago when, with my German colleague Wolfgang Schäuble, I launched a campaign for a new international deal to catch people who evade their taxes by hiding their money overseas. I never expected that within such a relatively short period we would succeed in getting 51 countries to sign up to this agreement. Today we strike a blow on behalf of hardworking taxpayers who are cheated when rich people don’t pay their taxes. Today we send a clear message to those who still think they can escape making a fair contribution to our public services and to reducing our deficit: you can hide no more; we are coming to get you. 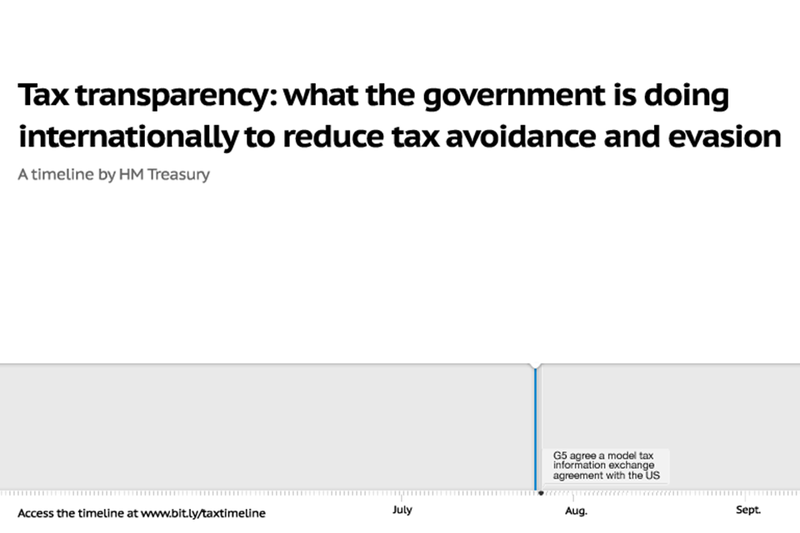 Want to understand what today’s announcement means, and the progress we’ve made in clamping down on international tax evasion? Our interactive timeline sets out the background. The UK has been leading the international fight against tax evasion, including through its G8 Presidency, and has played a crucial role in driving both the development and the early implementation of the new global standard adopted by the OECD in July this year. The global standard of automatic information exchange to tackle tax evasion was developed by the OECD and agreed in July 2014. 51 countries and jurisdictions, including all G5 countries, are signing the multilateral competent authority agreement under which information will be exchanged at a signing ceremony at the Global Forum in Berlin today. Together with France, Germany, Italy and Spain the UK launched an initiative for early adoption of the new standard in April 2013. In total 57 countries and jurisdictions – known as the Early Adopters Group – have now committed to a common implementation timetable which will see the first exchange of information in 2017 in respect of accounts open at the end of 2015 and new accounts from 2016. The full list of countries committed to first exchange in 2017 or 2018 will be released by the Global Forum in their annual report at the end of the 29 October plenary session. Photo by Alan Cleaver on Flickr. Used under Creative Commons.